If you have to do a lot of work on your desk while keeping several books and documents then a roll top desks are the best options. Nowadays one can find a computer in every home. These are placed on home computer desks so that you can work comfortably without straining your eyes and neck. You can find a wide collection of these desks in market and can buy one that matches your budget and requirements. They are made up of different materials such as wood, plastic, metal and glass. Wooden desks are mostly preferred as they are stylish, sturdy and can go well with traditional look. These desks are made up of durable material and usually come with wheels for mobility. Although bulky desks like U shape desk are more stylish but these are not suitable for home use as they require a lot of space. If you have to do a lot of work on your desk while keeping several books and documents then a roll top desks are the best options. These desks provide you with several square feet space on top of the table. You can also store your books and documents in the drawers of these desks. Another type of home computer desks is compact desk. This desk can accommodate a monitor, keyboard and mouse. However, the table top space is limited. These desks can be used as computer station rather than a work space. Small computer desk is frequently used in homes as it occupies less space. It provides limited space and you can place a single monitor of flat screen style monitor. 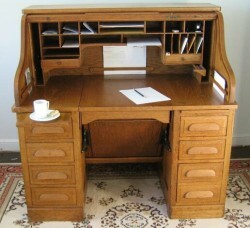 This type of desk has a hutch and overhead storage space. There are cabinets and different places where you can store CDs and other computer accessories such as printer, scanner and speakers. These desks are designed to place laptop. There is a niche in it to place computer and sliding trays for mouse and keyboard. Glass computer desk is another popular desk used in homes. This desk consists of a glass top that is placed on metal stand. Steel is most commonly used to make support. These desks are light in weight and can be easily moved around house. Price of home computer desks depends on its size, quality and style. Wooden desk are more expensive as compared to others because of its durability.